CARLSBAD — Peace between Palestine and Israel is not likely any time soon. However, through the nonprofit Hands of Peace, students from Palestine, Israel and the U.S. are brought together to meet, learn and develop relationships to help end the conflict between Israelis and Palestinians. For the last three weeks, families and students in North County hosted about two dozen students from the Middle East. For the protection of those students, their last names and identity of the host school for the program will not be disclosed. Nimrod, an Israeli-Jewish student, and Omar, a Palestinian, both had never met a person from the other side. For as long as history can remember, the two sides have engaged in bloody battles, with the intensity ratcheting up recently with fighting in the West Bank and Gaza Strip. Nimrod, meanwhile, returned to Israel and enlisted in the military, which is required for all Israeli citizens. He said the program challenged his way of thinking, and he and Omar, among others, have become determined to end the violence. And although the two students had a three-week reprieve, both have to come like and respect each other, thus becoming driven to end the violence. They both said it is up to their generation to stop the fighting, find a peaceful resolution and live in peace with each other. Hands of Peace organizes two locations for its program in the U.S. — one in San Diego County and the other in Chicago. The students spend three weeks stateside before returning home. It is a two-year program building trust, friendships and positive experiences in one of the most dangerous conflicts in the world. Over the past 15 years, more than 500 students have graduated from the program, according to Heirenat. 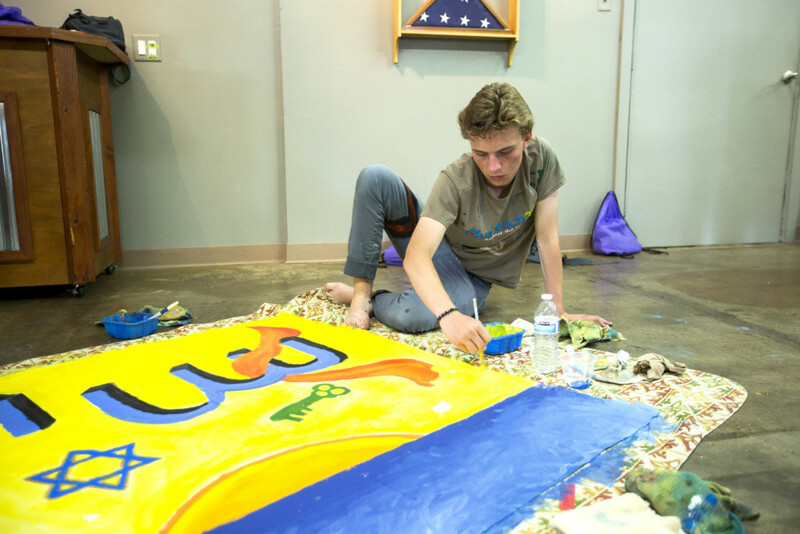 On July 27, the students gathered at a local arts center to paint and create. The students joined efforts on several pieces, all the while covered in paint, laughing and strengthening their bond. It is just one of many activities the students engage in during the three-week program. Becca Henry, a student at Pacific Ridge School, was one of several American students hosting their Middle Eastern peers. Also in her second year with the program, she said it has opened her up to what the people caught in the crossfire and violence are dealing with on a daily basis.